1.Concentrate our efforts on building a strong and healthy turf population to crowd out and resist weeds. Many of our customers with reasonably healthy lawns are choosing this method and have elected to use our Root Proliferator treatment to boost root density in the soil profile. Weed treatments per se are not used. 2.Use the weed management products that are currently available but recognize that they may fall short of the expectations that we were accustomed to in the past. Spot treatments are used to combat existing weeds. (up to 25% coverage). Not all weeds are susceptible to these treatments. Watering - Water deeply. Light watering encourages shallow rooting which makes for weaker grass and thatch formation. Water about once a week on average. The lawn needs about 1" of water per week. Check your sprinkler by placing a tin can on the lawn to see how long it takes to get 1" of water on your lawn. Mow right away. Don't allow the grass to get too long between mowings. If you cut off too much at once, the grass will go brown. Removing more than 1/3 of the plant is very hard on the roots. Keep your blade sharp. Mow high. Keep your mowing height at 3" for most of the season. A higher cut will provide more shade and keep the soil cooler and moister. The extra shade also discourages weeds, crabgrass and insect pests. Mow shorter near the end of the season, especially the last cut. Thatch - Excessive thatch favours disease development and will harbour insects. Aerations are one way to reduce thatch. Rake the lawn in the spring to dislodge surface thatch. Fill in bare or thin areas with new grass. 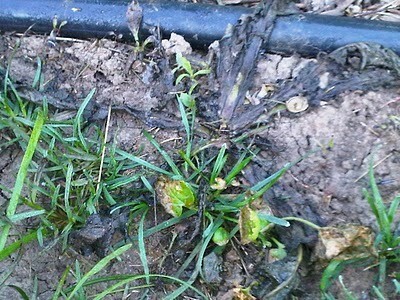 Weeds and crabgrass are less likely to get started in your lawn if you can get grass growing first. Grass seed will grow fairly early in the year before crabgrass or many weeds are active, but will sprout at any time if kept constantly moist. Fall is the best time to seed (Late Aug thru Sept). Use “endophytic” perennial rye seed turf-type grass that naturally resists insects.